Cedric Maxwell – 8 seasons – 2 championships – was a malcontent towards the end and only averaged 11.5 PPG his last three unspectacular seasons. Wilt Chamberlain, Elgin Baylor, Kobe Bryant, Gail Goodrich, Magic Johnson, Kareem Abdul Jabaar, Shaquille O’Neal, James Worthy, Jerry West, Jamaal Wilkes – WOW – Talk about the cream of the crop and setting the standards for all professional sports teams for retired numbers. How come no Byron Scott, Kurt Rambis has four rings, Michael Cooper, Derek Fisher?…I guess no role players or multi-championship winners that weren’t superstars get numbers retired for the Lakers. Do you have to be inducted into the Hall of Fame to qualify? 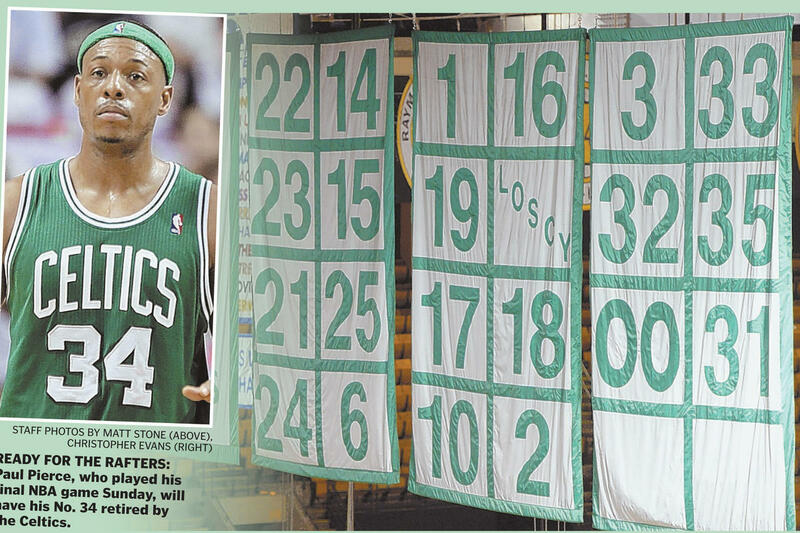 Does your number being retired detract from the most deserving ones? Sorry New Jersey and now Brooklyn Nets, please unretire John Williamson and Bill Melchionni so Julius Erving can live in peace. Denver needs to unretire Byron Beck and Dikembe Mutombo who played five of his 19 seasons with Denver. Yes the finger wag is something I will never forget and sometimes mimic with my extraordinary shot-blocking abilities, and he led the Nuggets to one big playoff series comeback over Seattle, but no dice. Let Alex English and the human triple-double Fat Lever get the credit they deserve. A question for Golden State Warriors fans – Who doesn’t belong in the rafters? Chris Mullin, Rick Barry, Nate Thurmond, Tom Meschery? Houston, we have liftoff but unfortunately you need to unretire Clyde Drexler in spite of the one championship he was apart of because he only played 4 of his 16 seasons for you and if anything underachieved during that time span and if you don’t, we will think you are pulling a Cleveland like they did with Thurmond. By the way, how do you justify retiring Drexler, but not Kenny Smith, Robert Horry or Jerry Sichting’s bully…Ralph Sampson. Memphis has announced they are eventually retiring Tony Allen and Zach Randolph when the time comes. This is the first time I propose an announcement be rescinded before the Grizzlies embarrass themselves in a desperate ploy to put something in their rafters. Miami – no-go with Tim Hardaway as he only played six of 15 seasons for you and won nothing. I also am still mad the Celtics drafted Michael Smith over you. Phoenix – I love this one. Alvan Adams who played 14 seasons for the Suns had his number retired and then unretired when Grant Hill joined the team in 2007. Adams felt bad because poor Grant had always worn number 33 and didn’t want him to have to wear another number…perish the thought. I can see it now. While LeBron eventually keeps searching for teams he can latch on to win a championship and settles on Chicago, can you just see Michael Jordan saying, hey you know what LeBron, you can wear my 23 and I’ll tell the Bulls to take my number down for the time being. Portland – uggh what a scary list as they by far have the longest list of glaring mistakes and that doesn’t include drafting Sam Bowie over Michael Jordan or Greg Oden over Kevin Durant or forget it I am just being mean now. Please Portland unretire Dave Twardzik, Larry Steele, Bob Gross, Lionel Hollins and maybe consider retiring Jerome Kersey just because I loved announcing his name as a kid in my driveway. I also nominate Kevin Duckworth because of his prototypical NBA body and because he was a Portland center that didn’t break down every five minutes. For San Antonio, I am unretiring James Silas and perhaps the toughest unretire besides Dennis Johnson is former NBA superstar 😊 and Cal State Fullerton great Bruce Bowen. I only decided to put him on the list because he agreed to unretire it so LaMarcus Duckworth, I mean Aldridge could wear it. Since it got taken down anyway, let’s just be efficient and keep it down now. One last note, the Miami Heat did an honorary retirement of Dan Marino which I am assuming was done out of pity since he could never win the big game. But the good news is and this is the best part, despite being retired, Marino’s number is still in circulation currently worn by NBA great Bam Adebayo. Did I mention that Cal State Fullerton made the NCAA tournament?